How long will Elizabeth McCord remain Secretary of State? Has the Madam Secretary TV show been cancelled or renewed for a fifth season on CBS? The television vulture is watching all the latest TV cancellation and renewal news, so this page is the place to track the status of Madam Secretary, season five. Bookmark it, or subscribe for the latest updates. Remember, the television vulture is watching your shows. Are you? A political thriller airing on the CBS television network, Madam Secretary stars Téa Leoni, Tim Daly, Bebe Neuwirth, Željko Ivanek, Keith Carradine, Sebastian Arcelus, Patina Miller, Geoffrey Arend, Erich Bergen, Kathrine Herzer, Wallis Currie-Wood, and Evan Roe. The drama follows the shrewd, determined Elizabeth McCord (Leoni). As U.S. Secretary of State, she battles office politics, while driving diplomacy and negotiating global deals. Elizabeth was once a CIA analyst, who exited that post for ethical reasons. She later returned to public life, at the request of President Conrad Dalton (Carradine). He values her apolitical leanings, knowledge of the Middle East, flair for languages, and unconventional thinking. Elizabeth is married to Henry (Daly), a former theology professor who is now an intelligence operative. Together, they’re bringing up three children, which can really test her diplomatic skills. The fourth season of Madam Secretary averaged a 0.63 rating in the 18-49 demographic and 6.16 million viewers. Compared to season three, that’s down by 28% and down by 26%, respectively. Find out how Madam Secretary stacks up against the other CBS TV shows. Madam Secretary has been renewed for a fifth season which will debut on October 7, 2018. Stay tuned for further updates. 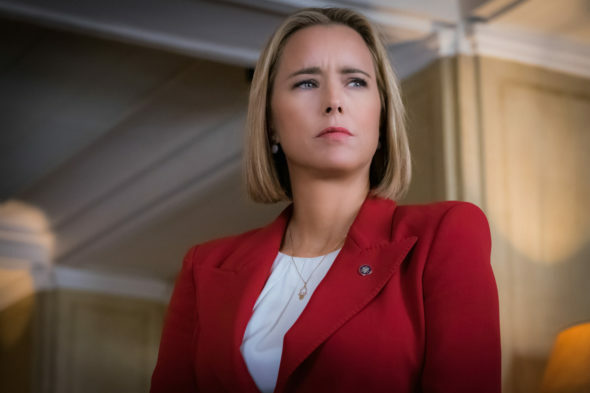 Will CBS cancel or renew Madam Secretary for season five? In the 2016-17 television season, this show’s demo ratings ranked 20th out of 26 scripted CBS series, but it drew enough viewers to rank eighth in terms of audience size. This installment will give it a decent sized syndication package, so a cancellation is somewhere between possible and likely. For now, I’ll keep an eye on the ratings and update this page from time to time. Subscribe for free updates on any Madam Secretary cancellation or renewal news. 4/18/18 update: CBS has renewed Madam Secretary for a fifth season for 2018-19. Details here. TV show ratings are still important. Follow Madam Secretary‘s weekly ups and downs. Find more Madam Secretary TV series news or other CBS TV show news. What do you think? Are you glad that the Madam Secretary TV show has been renewed for a fifth season? How would you feel if CBS had cancelled this TV series, instead? Please cancel !! It was one of my fav0rate shows until this season. Now it’s like watching a late nite show that strives to degrade conservative viewpoints!! fair enough, but not what I turn on my TV for!! The show has turned hard left and we will no longer watch it!!! This program is very entertaining and informative. Gives all of us some insight into the tightrope the State Department must walk to negotiate with other countries. I am very happy this series has been renewed. The issues presented on the show are extremely timely and informative. This is an important show. It gives a glimpse of how our government works, the issues facing it, the difficult decisions that must be made, the effects those decisions have and how hard it is on those in charge. I realize it is not exactly true to life, no government official ever gets to spend all their energy on one crisis at a time. But even so, it has been an eye opener for me and enormously entertaining. My husband and I watch Madam Secretary every Sunday that it is on. We love it! Please don’t cancel it! It case you didn’t get my first post I want Madam Secretary to turn into Madam President!!! I love this show. Best one on tv. I’m tired of everyone turning old shows and old movies into new ones. This show is the perfect one for our country at this time. Great show!!! Don’t cancel it. Can’t wait for it to be Madam President!!!!!!! Absolutely! That’s what I’m looking forward to my own seelf. I look forward to the 5th season Of Madam Secretary. Please do not cancel it. I LOVE this show. Wonderful to see a such a strong woman acting with grit and integrity and in position of great influence and power. Please Do you not cancel this series. I enjoyed the cast and the politics. The only time you can cancel it is if she runs for president then you’ll need a new title. Love this show!!! Wholesome, exciting, patriotic TV! We love the series. Exciting and entertaining and a politically interesting take on the role of Secretary of State. Great cast. I find myself rewatching episodes and I never tire of it. I love love this show. It has suspense,action, energy, and lots of drama packed in a one hour episode. The Washington political spin that is woven into each show seems to be taken from much of what is happening or could be happening today. The family dynamics coupled with the political intrigue of this show make this one of the BEST TV SERIES.